As Stevie Stone references on “Perfect Stranger”, most Strange Music fans were first introduced to the emcee during his stint on Tech N9ne’s K.O.D. Tour in 2009. Following his national run the tour, Stevie Stone was embraced by the Strange Music fans, which would eventually lead to his signing in 2011. 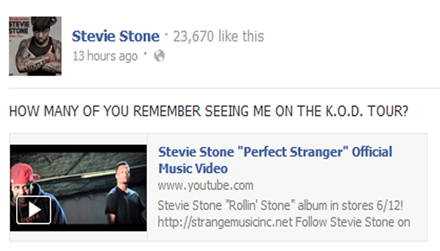 Do you remember seeing Stevie Stone on the K.O.D. Tour?